Where Do The Leads Come From? What is Auto-Ship and how does it work? How do I update my email address and other information? How do I change the number of leads I receive daily? What is a CSV file? Where do I find my leads? Objection: Where did you get my information? What is the difference between buying a “list” and “leads”? 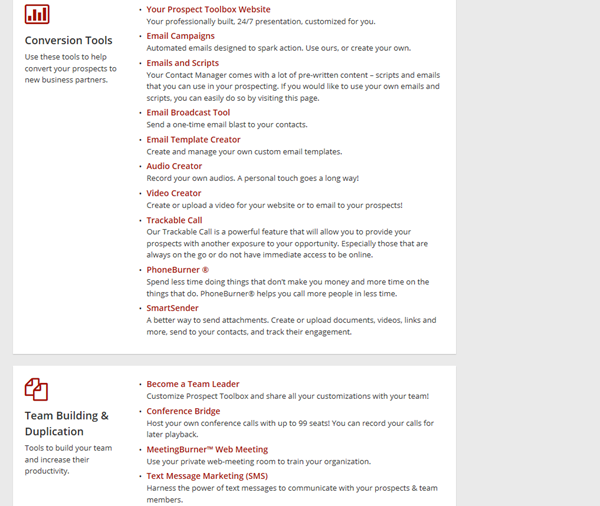 Inside Prospect Toolbox you will find your “Contacts” where you can take notes on every call and lead. 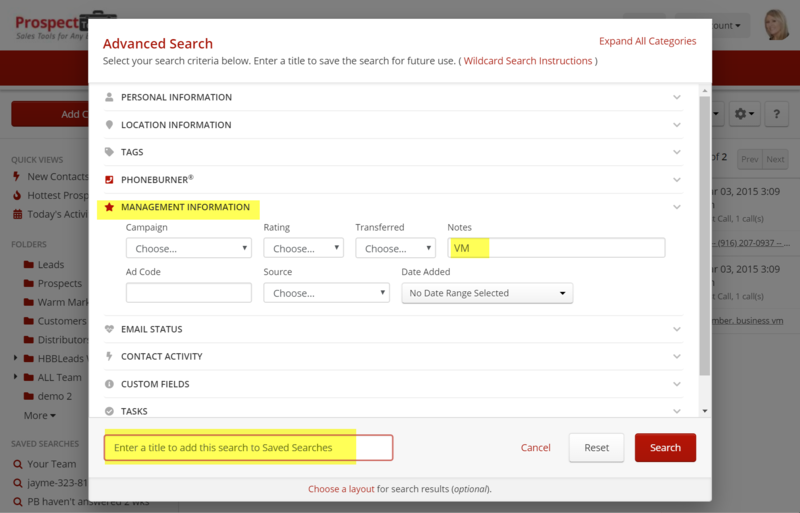 After you have been using the note-taking features, in the future if you are looking for anything specific, you can use the advanced search to find it! You can also take notes during dial sessions or phone burner sessions. During your dialing session buttons appear at the bottom of every call. Every time you press a button, PhoneBurner automatically takes a note of this action and sends a matching follow-up email (if an email is matched to that button). By default, most of these emails are already created for you and contain your personal information. Find them here after logging in, and change what emails are sent with each button pressed in the Dispositions * advanced users. After you click on “Live Answer” more buttons will appear. 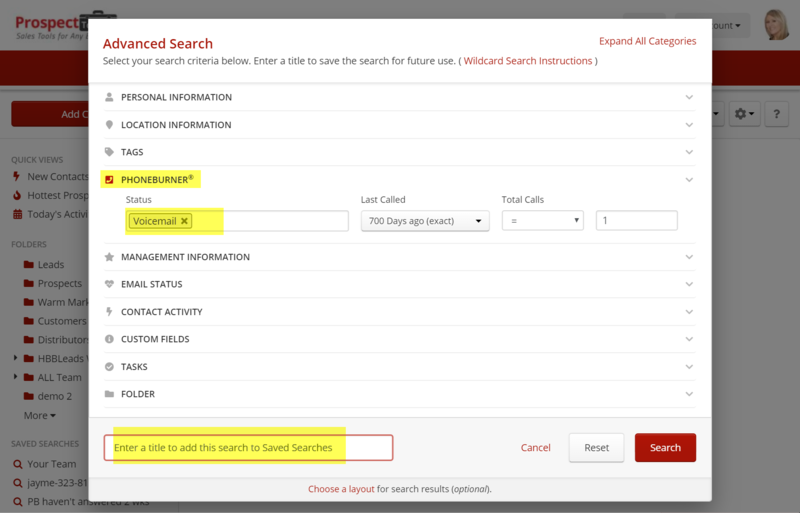 After using PhoneBurner you can search by the different PhoneBurner buttons you pushed during your dial sessions. PhoneBurner takes a lot of notes automatically for you just by pushing a few buttons during the calls! For example. you can use the “Advanced Search” to create a “Saved Search” of everyone you left a voicemail for. You can use this search anytime you have wanted to try calling your leads for the second time. Using the note-taking features with the advanced search features will allow you to easily manage hundreds or thousands of contacts! Comment below or contact us for help. Have you ever heard this saying? When you take great notes on your lead calls, your results always continue to improve! If dialing leads are not yet getting you the great results you desire, yet hear other people having, you will learn exactly why when you take great notes on your leads. Exactly what step is not working? Is it getting voicemails answered? Is it your introduction interview? Is it the follow up after a presentation? You can then look at the patterns, show your notes to your upline, ask HBBLeads support for help, search our training articles, google search, or ask an expert. Note taking and follow up is a critical step to have success with dialing leads. 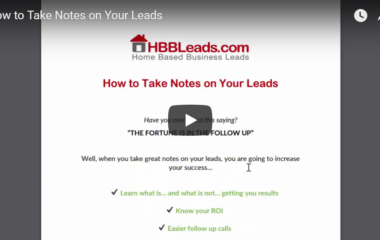 Use the following pages to take better notes with your leads. Be sure to add more columns and rows to our sheets, customize them, and use whatever methods work best for you. In addition to taking notes, you absolutely need a Calendar before you call leads. Pick one, stick to it, and use it every day. 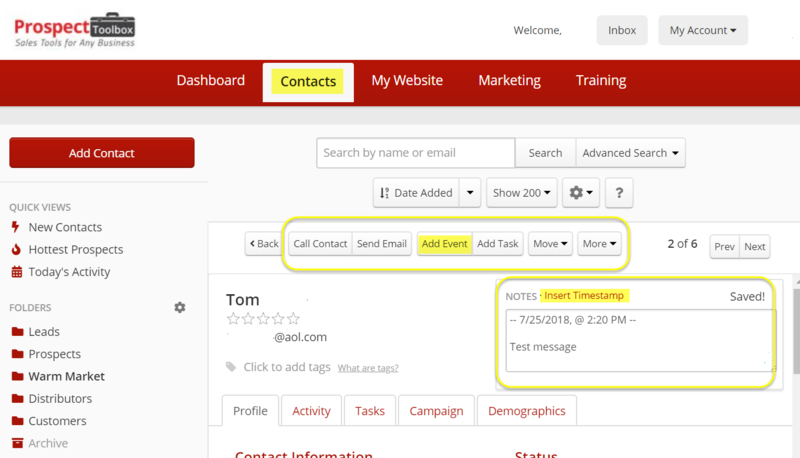 Prospect Toolbox: use the Events calendar for automatic reminder emails, text alerts, and more. How Many NEW Leads Per Week? Depending upon the volume of leads you are currently working with, you may want different solutions for the easiest management. It’s up to you to decide what information you need to remember for future calls and appointment. Here are some ideas to get you started. What are their income goals? How many hours per week can they dedicate to a new opportunity? What have they done for work before? Did they watch a presentation from you? Which one? What did they like about the presentation? 2. Always write the DATE next to every phone call, voicemail, etc. 3. Schedule follow up calls your calendar. You will need to schedule follow up calls if you called them at a time they are busy (most common), to do a 3-way call with someone else, to give them a longer presentation, to follow up and answer a question you did not know the answer to. Use whatever calendar you will actually check every day. It can be a paper wall calendar, an app on your smartphone, etc. BAD – bad lead with a non-working number, wrong person, etc. Notes: 7/25/18 P, TXT video, called back after video, leaders said they liked the products but worried about $500 startup cost. Has kids named Amanda and George in elementary school. Wants to know about selling products at local events. May not be able to join yet. Schedule 3-way meeting call with upline about selling products at events. 7/25/18 P, used to work in construction but laid off, looking for part-time work. Was busy and need to call back later. Some customers like to print every email, on a single piece of paper, then write in notes during the call. Then use a 3-ring punch to put the good leads in a binder with all of their notes. Most of the Live and Fresh Leads from HBBLeads can be delivered to you via e-mail, one lead at a time. You can choose this option during checkout for your order, or contact our support staff. 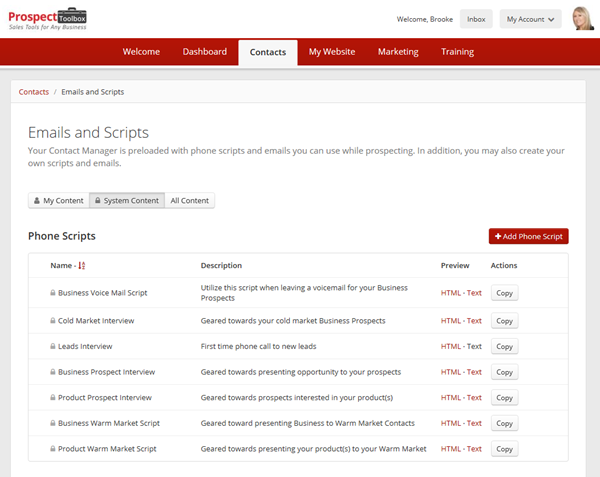 You can also send each lead to yourself via email from inside of your HBBLeads customer control panel. You could either keep filling in the information on your computer or print your spreadsheet to write in notes. Login to your customer account ay HBBLeads. Click “Download Now” next to your order. Format your spreadsheet using Excel or a similar program. Continue adding columns and notes as needed. You will need to expand the columns in your spreadsheet program to see all of the data. Format the spreadsheet to add more space for writing your notes. When you are on the phone with a lead you can take notes right inside your spreadsheet, always remember to save when finished. You can occasionally go and copy all of your GOOD leads into a new spreadsheet, note-taking program, etc. where you have more room to continue taking notes. You can use the tabs at the bottom for different kinds of leads. Keep adding to your spreadsheet in whatever way works best for you. 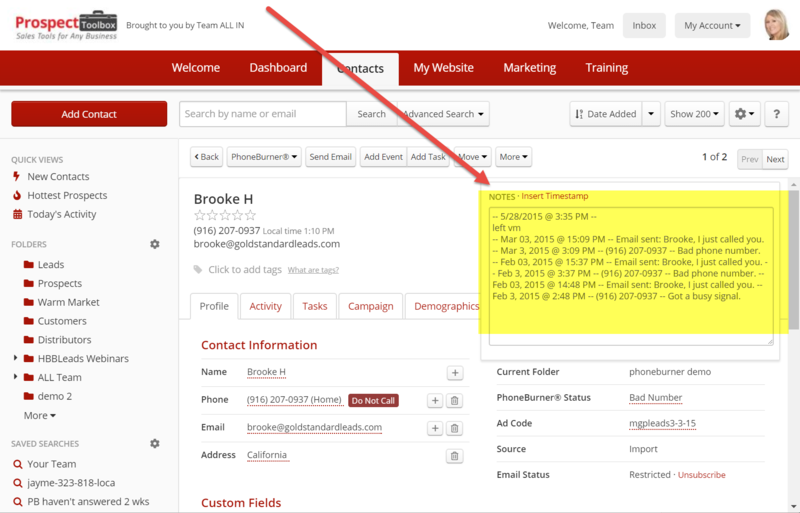 Inside of Prospect Toolbox is an area for adding a date stamp, note taking, and adding “Events”! Events will send a reminder email to the lead, add it to your calendar, send you reminder e-mails, and more. You can even set up Text Alerts” to remind you of follow up appointments. You can then “search” your leads any way that you want… by date range, area code, number of voicemails… there are almost infinite options. Is there a specific word, phrase, or script that you mentioned… that gained more / less interest? Is there a specific video that had no response? What worked the best today? What didn’t work today? Keep improving what isn’t working! Who can you ask specifically for help about what didn’t work? o If so, find help to improve such as looking for scripts from HBBLeads, or ask your upline for a better video, etc. Keep adding more of what IS working! How many calls did you make? How many scheduled a presentation? How many scheduled a follow-up? How many joined or are interested in joining? You will start to notice WHAT DOES WORK and WHAT DOES NOT. Soon, you can start to use only scripts, videos, etc. that get you great results! You will know which types of lead orders are working for you, and which ones are not. Like learning how to play an instrument or learning how to do anything, you will keep getting better! 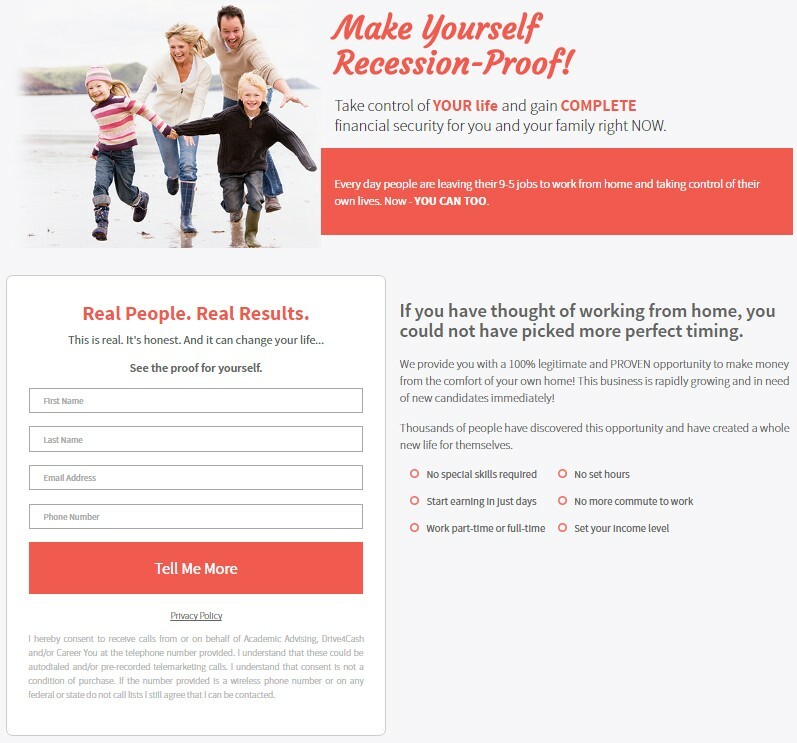 Have you, or anyone you know, within 30 minutes of showing your business to a family member or best friend… received an enrollment within those first 30 minutes? How many enrolled after a few days? A week? A month? (usually a few). Remember that leads are just people like you and me. They need time to build a friendship, trust, get all of their questions answered, think about it, etc. This is a SALES FUNNEL aka PIPELINE. You are also doing what is called Split Testing. Which means that you can try different scripts, videos, etc. until you find which ones work the best. Download the PDF to print and share with your team. If you ask software developers to create a “custom system” the average price is typically anywhere from $15,000 – $30,000! Wow! Here at HBBLeads, we have a very unique solution for team marketing solutions, where you can build your own marketing system for your team, for a fraction of the price, and receive free leads every month for you and your team! Team Logo and Name: Brand the system dashboard with your own team logo and name. Phone Scripts: Create your own phone script templates for your unique opportunity. 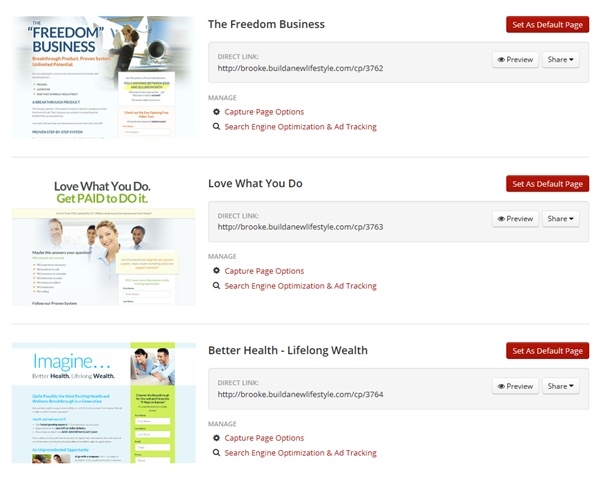 Lead Capture Pages: The system is ready to go with 9 home business capture pages, or use our easy lead capture page builder to create your own custom lead capture pages. Email Templates and Email Campaigns: Write your own e-mail messages and campaigns. For example maybe you have an email campaign about the company products or a welcome email campaign for new enrollments. Calendar Entries: Add team events, they will show up on your team’s calendar too! Audios: Add your own recorded audio presentations. Videos: Add videos from Youtube, Vimeo, or upload your own files. Instantly in your teams back office. Trackable Calls: For phone presentations, you will know who listened to your call! PhoneBurner Settings: have pre-recorded voicemails, customize the dialer set buttons, and more. SmartSender : Similar to having a dropbox to store files, then you can build simple funnel pages with these resources. For example create an enrollment page for your leads with your companies compensation plan video, add image slides, documents to download to enroll, and an enrollment link. 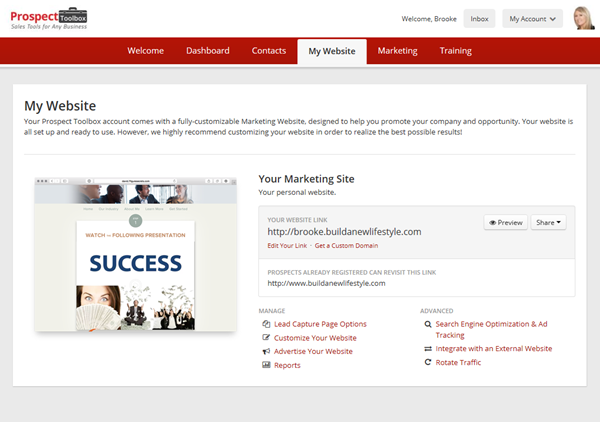 Marketing Page: Write your own marketing advice for your team, and have it show up in their accounts. Training Page: Write your own training advice for your team, and have it show up in their accounts. Lead Co-op / Distribution / Sharing: With this system you can place an order from HBBLeads, and then set up a lead rotator to automatically move leads from your account, and post leads into team user accounts! ** You get to pick-and-choose every single piece of your content to share with your team, so you can have both your own personal private content and shared team content in the same account. Order a Prospect Toolbox system at the Premier level ($1 trial then $49.95/month) to build and customize your team marketing system! What level membership do you and your team need? The ability to be a “Team Leader” and build a team system is also available at both the Premier ($49.95/month) the Exec Level ($119.95/mo). For your team, they can subscribe to any level Prospect Toolbox ($29.95-$119.95/month) and have access all the team content you created for their matching account level. At every account level, we offer a $1 for 10 day trial with bonus free monthly leads, no contract, and users can upgrade or downgrade at any time. What’s are the differences between a Full Custom System vs. Prospect Toolbox system? Let’s get into more detail with Pro’s and Con’s in case you are wondering what else is a factors into the different price tags, and need help evaluating which one is right for you. This list is based on past consultations and evaluations done for our customers and clients. The specific numbers and facts vary depending upon the features of your system, the software developers you are contracting with, the size of your team, and so much more. The most frequent price tag we see in proposals currently from multiple companies is $30,000. Pro’s: the system is built for you by developers, branded with it’s own custom brand and website URL from start to finish, may include a mobile app, may include a share in revenue if you are selling the system to your team users, may be fully customization to add specific funnels, pages, remove features or add features, may be integrated directly with your MLM company as a part of their back office features. Con’s: the price of the system or the price you pay to build usually also depends upon a guarantee of adding a specific number of users to the system, typically takes 3 months to develop and launch, training content may not be provided, price is on average $15 – $30k. If you are interested in a system like this please contact support. We can help match and introduce you as we have a long history and experience working with the best system software developers. Pro’s: system comes with plenty of pre-written scripts / emails / capture pages ready to go or you can edit for your team, each account level includes free leads from HBBLeads, no quotas or requirements for a specific number of team users, no contract, no additional set up fees (unless you want to hire a consultant from us for additional help), you are welcome to use our Prospect Toolbox training videos and content to train your team, you can brand the “back office” dashboard with your logo and team name, users can brand their own marketing resources with their own website URL, system set-up time can be as fast as you want because our system is already up and running (it is up to you to add the content and invite your team), most system features work on a smartphone browser and have mobile text alerts. Con’s: you create all custom content and additional design (upload the videos, write the emails, etc. * may want to hire someone from our staff as needed for help), basic system features cannot be added or removed (because it is a shared system, you can only change the content), users will sign up through HBBLeads and/or Prospect Toolbox only (because it is a shared system), no mobile app (however most features work in a smartphone mobile browser). Neutral (about the same as any system): all users subscribe for $29.95-$119.95 per month to have access to their own account on your team, team users can be on any level package and upgrade/downgrade/cancel at any time. You are creating an automated machine that works for you, and will help your leads get to know you personally. Write whenever you get inspired! Do you want to tell this fact or story to more people? The add it to a newsletter right away! FUNNELS: Create folders + email campaigns for any reason: old leads that haven’t responded, active downline, inactive downline, new leads, local leads, people you need to follow up with, etc. Be conversational, like you talk to friends, tell stories, use your own words, be interesting and authentic, share real photos, tell a story about a recent event, share videos of you. Help then get to know you, your personality, the business… it’s all about sharing the real story about your business. If you do the bare minimum (only using our templates and free leads) you will get the bare minimum results. Do what leaders do.. give 110% and have a system sharing YOU and your unique story business around the clock. Connect with us on Facebook for more training, freebies, etc. Plenty of space for notes or to write your own scripts! We also recorded a webinar explaining this PDF, so you cat watch a lot and fill out your own scripts and take notes, or use for training your team! New Course is Coming soon! Do you feel frustrated with so much to do? So much to learn? How to follow up? When to follow up? And what to do about those “interested” people that never actually join? In this course, we cover all of that and so much more. In the network marketing industry, there are a few KEY FACTORS to growing a massive organization. In this course, we give you a SIMPLE DETAILED LIST of the closing process! It’s taken us over 10 years to create such a simple summary. We give you a list for the long-term strategy too. Because in network marketing specifically, the goal is building a big organization that organically grows itself. With this detailed list, we train on each of the 8 individual step-by-step items, with a detailed tutorial video for each! You will also have access to Q&A in the comments section. To be notified when this course becomes available, simply make sure you are following us on social media (facebook), or have an account with us at HBBLeads (you can create a free, no cost account here). Split Testing: Secrets To Your Network Marketing Success! Do you want to know exactly how to improve any marketing campaign? Do you want to know how to have results from marketing in almost anything you do? Split testing means that you are always trying different things to see what gets the best response. How do you set up split test? You simply need to break down how you do your marketing, one small item at a time. For example: Start with your opening sentence when you call leads. Good afternoon, this is ____ calling about your interest in making money from home, how are you today? Do you have a moment to talk? Hello, this is a courtesy call for (Lead Name), my name is ____ calling about your interest in making money from home,. I am calling to make sure you received the information you requested. Use each one on at least 10 times or more. Make a note of which one had a positive response, where the person wanted to talk to you more, and notes of when people became distant and tried to end the call. You will notice when you say certain phrases they light up with excitement, and with other phrases, they pull away and start to become negative. TAKE NOTES! Next, you may want to try testing 3 different videos explaining your business. Again, watch how people respond to each video and always take notes. Over time, and it does take time, you will see patterns. You will learn that your leads generally like it when you say certain words, and get turned off by others. You will find you get more interest from some videos and no responses from others. The more you do this, the more your marketing becomes predictable and successful! You can eventually get to a place where you know your entire marketing process, and you know that it gets positive results! You will also know which words and videos do not work, and need to be removed from your process. Always be taking notes on how people respond to your words, videos, emails, texts, and so much more. Even if you have a problem with a part of your enrollment process that you can’t solve… you now know WHAT you need to solve. For example, let’s assume no one is responding positively to your video. You can contact your upline for help and ask what video they are using to get results. You can test even more videos. You can ask your leads directly “be honest with me, what didn’t you like about the video?” and use that information to help you find a different video or create your own video or webinar. Always listen closely to your prospect’s response to your words or marketing materials. Always be taking notes on responses from every single small piece of your advertising. You can review your notes every day, week, or month. The more you remove what is not working, and do more of what is working, the more your business will succeed! This post is PURE GOLD. We hope you will bookmark, save it, and use it over and over again. Watch this Prospect Toolbox demo, where you will see a presentation for a new customer looking for a way to manage 1,000’s of contacts. You ask, we answer. HBBLEADS Prospect Toolbox network marketing solutions explained. Everyone, this is Brooke from HBBLEADS And in this video, we’re doing a webinar to go over the basic features of Prospect Toolbox and talk about what it is. Alright, so I was talking to Renee earlier this morning, and she was talking about building her business with maybe a thousand leads at a time, and I had to suggest prospect toolbox. 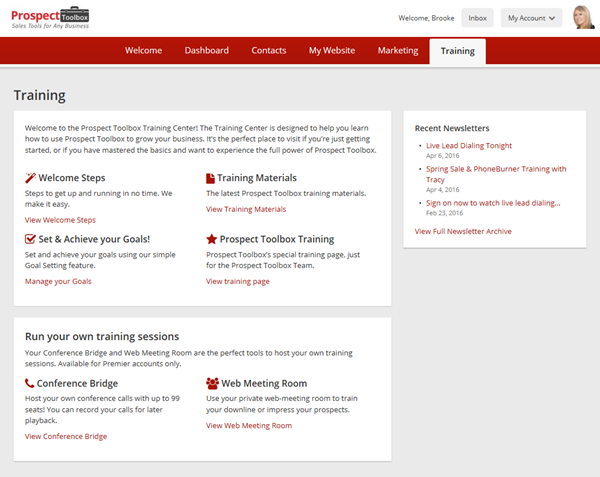 .Okay, so what you’re looking at right now, this is the home page of HBBLEADS as You’re familiar, and you’ll find prospect toolbox, all over the site, and you can also order a here and you probably notice that it’s one dollar for a ten day trial. And we did that for a very specific reason, and that is that you need some time to set it up, you do some time to get under the hood and create all the settings.I’m gonna show you that today, what it looks like and this or trial in that 10 days, there’s no setup fees, there’s no contracts, there’s no cancellation policy, and you can upgrade and downgrade at any time from inside your customer account with us. And I have a little bit of a demo account here. If I can show you. I don’t know if it has the settings, but I’ll show you what it looks like. 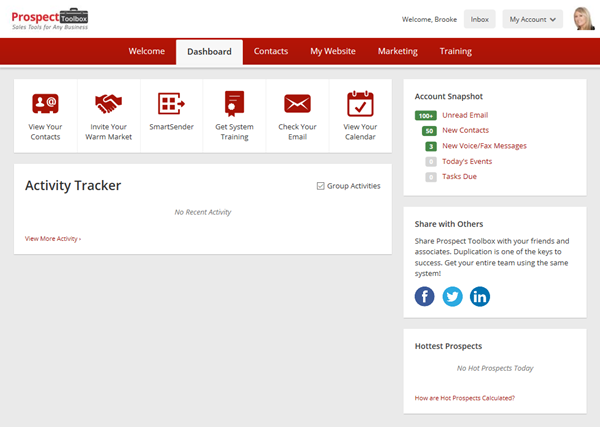 When you have a customer account with us, you have this control panel and you’ll see your settings here and all your prospect toolbox will be in your account. So if you’re familiar with us already, which you probably are, if you’re watching this video, you probably order leads to us in the past and you know, you know how to use the internet, you know how to log into an account and get what you need. Well, prospect toolbox, although it is a separate system from us is actually a separate company. We partnered with them in a way. So that when you logged in at HBBLEADS, your prospect toolbox is inside the same account, you can click one link and log into your prospect so you don’t need to remember two passwords. And also, when you receive leads from us to go into your system automatically… we’ll get to there, that later. Modify your account? You can come in here and click on this link. …you can upgrade, downgrade, cancel at any time. So if it doesn’t work out for you, you can just cancel it.[…. you can upgrade at any time, you can downgrade at any time. Say it is a slow season? Downgrade. No questions asked….] You can do all that here… we even have people over the years that maybe have the biggest package, which is the dialer and everything else. You can actually downgrade over Christmas and if you’re not gonna be dialing, may you take on vacation for a month traveling for a while, you actually downgrade to a lower package size, keep your leads and upgrade later. So basically, what I want you to know is that when you have an account with us, it’s really easy to manage. You can see your next billing date, you can actually update your credit card. This the users’ account will look a little different than yours will. Because this person has been here a really long time and they actually ordered a package we had, which is more… it’s not even that much, but he ordered a package that was a lot more than that a long time ago.But in here, when you modify your account, update your credit card log in your system all in the same control panel.So does that make sense? So when you get that one dollar trial, I just want you to know that you have full control if you wanna change the size of your package or you want to cancel or whatever, there’s no cancellation based on contract, just log in your account, make the changes that you need, right? 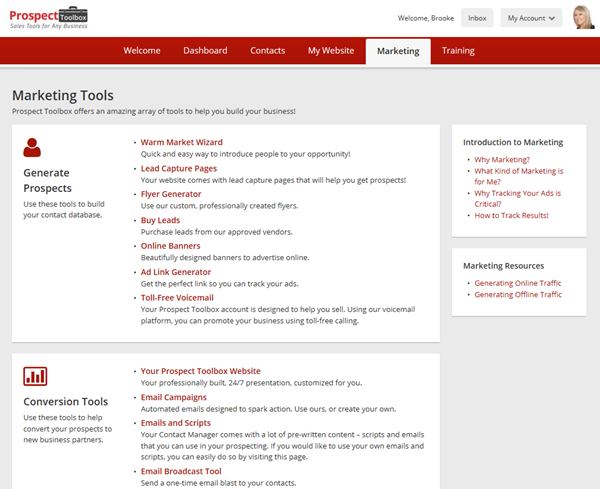 Live Leads, Fresh Leads are delivered directly to your Prospect Toolbox. So, let’s get into this a little bit. Okay, so this system has so many features. And what I’m going do here is talk about these important tips before I show you this system. These are really the most important things to know. Okay, so we already covered that one login is needed. We just covered that. Now, here’s the next tip, is that we deliver all of your live and fresh leads automatically into your prospect toolbox for you. So when every order leads from here leads, the leads will go into your system automatically, you don’t have to download anything, you don’t to import anything, they just show up. And I’ll be showing you a few minutes exactly where they land when they get there and what’s important to know those these age to leads the only ones we don’t send your account as both local leads, the leads have to be within 30 days old and the local, as are older than 30 days old, and we might occasionally have… so, specialty leads, for example, post cards or for direct mail, those don’t get loaded in your account. Got basically most of our leads. 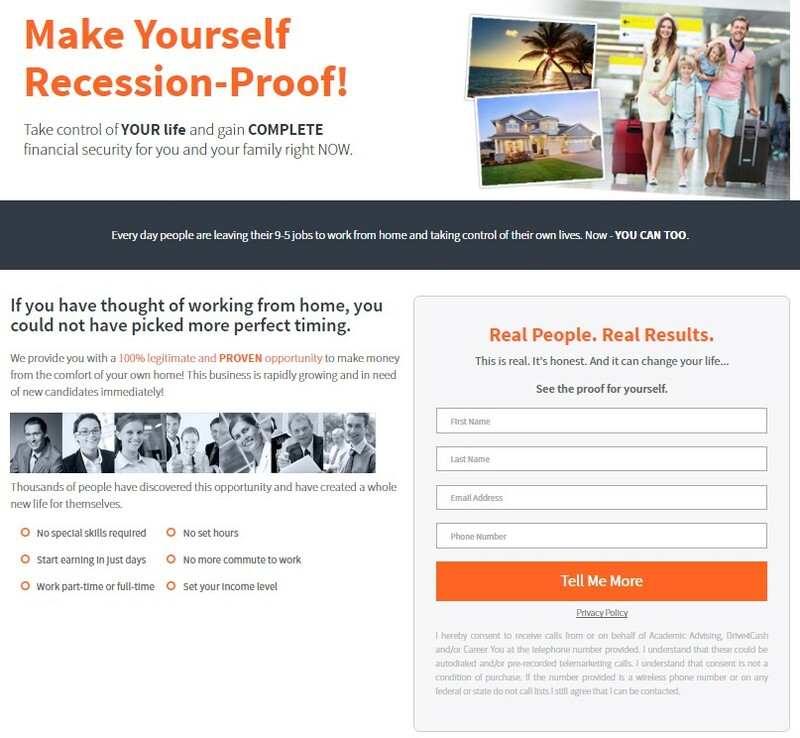 Any leads that are in 30 days old, have a name, email, phone number, those are gonna be loaded into account automatically, so you can start using the system and what happens with a lot of people that sign up is they think it would be harder than this. And we start looking for how to do all those things. Where do I log in? “How do I download my leads? Well, you just log in here and your leads are there, it’s already done. Here’s what a lot of people like … there’s so many users on the system right now and no one else has this. We have free leads with every account level and all we show you those account levels in a minute. And I want to talk to you about what the free leads are. This is really important. The free leads are 7-21 day nationwide leads. So you can see what these are. So these are nationwide, which means these are people responding to ads all over the United States and they are age leads. They can be up to 21 days old, we do well, here’s the thing, they’re free. so basically what they are, let’s look at the lead data so we can go here. You get the basic name, phone of our email dress. These are some pretty… basically, a nationwide. They answered an ad wanting to acquire about starting a home business or making initial income from home. And what I wanna show you, even more, is the pricing on these leads. Because when I want to show you, is that the system, it’s actually like a by one, get one free. we’d matched the system to the price of the leads when you get 50 free leads, which would be about $30. we have a $30 system, we do the math that works out, we have another one that’s 80 leads, which is about $50. and the, price. And then our 200 leads is a..
you’re going to find our system as the price is the same, we’re basically giving you these leads. It’s like a buy one, get one free by the way you price it out. I want to manage some expectations really quick too. 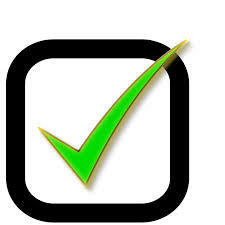 This video covers how to place a new order for Prospect Toolbox through our website. This can be helpful if you want to learn more about how our system works, and more details about the different settings and options.